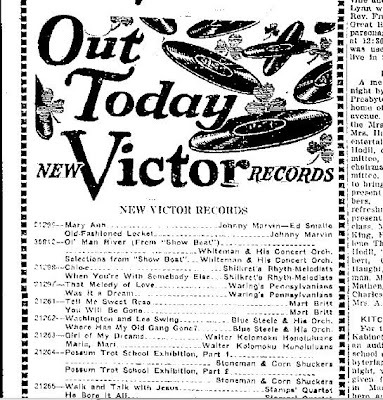 I am looking for Victor 21261, Mart Britt singing “Tell Me Sweet Rose” and “You Will Be Gone.” Above is an ad listing them from the Morning Herald in Uniontown, Pennsylvania from April 21, 1928. I think it is possible that Snoozer is on these Mart Britt recordings. If you come across this, please let me know!!! UPDATE! FOUND IT Jan. 2, 2010. Purchased and will be arriving soon. This entry was tagged mart britt, victor. Bookmark the permalink.